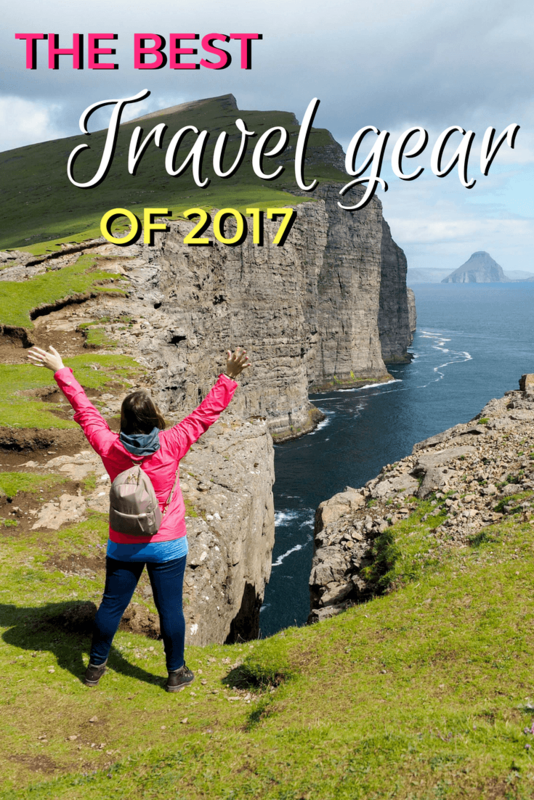 It seems to have become a summer tradition for me to write a post about my favorite travel gear. Some things on my packing list haven't changed in years; others I update and upgrade as I try new products and fall in love with new pieces of gear. One thing that is always the same, though, is the fact that I personally use and recommend everything that I feature in these posts! Here's a look at everything I'm packing this year. If all my other packing lists haven't been a dead giveaway, I'm a huge fan of packing cubes. Like, HUGE. I take them on every single trip with me, using them to organize whatever bag I'm taking, be it a carry-on-sized backpack or a larger suitcase. I usually use about 3 cubes: one for tops, one for bottoms, and one for miscellaneous things like sweaters or dresses. This makes picking out an outfit SO much easier, since you don't have to dig through every article of clothing in your bag. You’d be surprised how handy a dry bag can be on your travels. I’ve used mine for kayaking trips, rainy hikes, and even a boat trip where we had to swim to a beach (I was the only one able to bring a real camera with me!). I never go on a trip without my dry bag – because when you spend thousands of dollars on camera equipment, you want to make sure you can keep it dry! They take up virtually no room, so I always make sure to tuck one into my suitcase. I recently got the new Pacsafe Citysafe CX Convertible Backpack, and I'm in love with it. It goes from a handy little daypack to an over-the-shoulder purse in no time, making it extremely functional for traveling – two bags in one! It has many of the standard safety features I've come to expect from Pacsafe (durable material, slash-proof straps, and zippers that can be secured), AND is actually quite attractive, to boot. I've been traveling to a lot of wet places lately, like Norway and the Pacific Northwest. Meaning that packing a good waterproof coat has been essential! I've tried a few different coats over the last few years, and have finally found my favorite: the Columbia Arcadia II, which is lined on the inside with mesh (which helps it breathe better) and comes in a wide range of bright colors (perfect for those Instagram shots!). I never go anywhere without a scarf (seriously – one is ALWAYS in my bag, no matter where I'm going), and if you're a big fan of both form AND function, then Speakeasy's hidden pocket travel scarves are for you. These infinity scarves not only come in soft fabrics and cute patterns, but also come complete with a hidden zippered pocket that's the perfect size for a passport, credit card(s), and some cash. These are perfect for travel days – just put everything important in your scarf, wear it like normal, and skip the part where you worry about your essentials getting stolen in-transit. 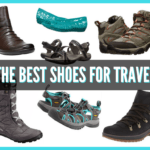 Read more about the best shoes for travel here. With 3 regular (US) outlets and 2 USB outlets, I never travel with out this Belkin surge protector. It doesn't take up a ton of room in my bag, but really comes in handy when I find myself in a room with too few wall outlets (it happens far too often!). This is also one of the most affordable items on this list, so there's really no reason not to have one! You won't always be traveling in places where they leave doors unlocked, or where you don't have to worry about the safety of your valuables. And when you've traveled as much as me, you'll know that the average hotel safe isn't big enough to fit things like laptops and full-size cameras. This is where a portable safe can come in handy. Pacsafe makes great ones that are slash-proof and able to be locked around a stationary object (like a bathroom sink). Worth it for the peace of mind! Lastly, I never go anywhere without one or two good cable locks. These combination ones are TSA-approved, and will work on just about anything, whether it's a locker on an overland truck in Africa, your suitcase, or the Pacsafe safe I mentioned above! 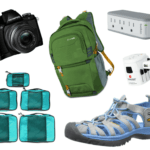 What's one of YOUR favorite bits of travel gear right now? Great post! I picked up several tips for items I will be purchasing. Thanks for the information! Great to hear! Happy to be able to give you some ideas. Those packing cubes look so helpful Amanda. Pack and save tons of space. Must have for any traveler; let alone a digital nomad like me. My favorite travel gear right now is the Osprey Farpoint 40. I don’t know if I can go back to a rolling carry-on now that I have the Osprey–it’s so well-designed and convenient to use! Thanks for the rec for a raincoat! I need one as the last one I got from Uniqlo turned out to be NOT water-repellent at all. I have the Farpoint 40, too! Great bag! 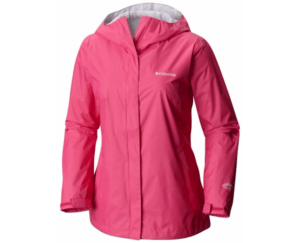 I’m obsessed with my Osprey Sojourn 60 though – favorite bag ever! And this raincoat is a good one – it’s traveled all over the world with me! I just have a little 5L one. It fits my phone, wallet, and camera, which is usually all I need to put in it if I’m hiking or kayaking or whatever. However getting a 12L one that could also fit your laptop wouldn’t be a bad idea if you’ll be on a trip where you’ll be carrying your computer a lot outdoors and/or on ferries/boats. Great list! I really need to get myself a Pacsafe bag, I usually just kind of wing it and hope for the best considering nothing bad has happened before. But I know that’s just the it-will-never-happen-to-me syndrome xD A dry bag is also a fantastic idea, need to get me one of those! I love the Pacsafe safe too. It doesn’t take up much room and it’s reassuring without being too over the top. One tip – swap the padlock from a key one to a combination one. It will save you locking both keys into it – I speak from experience! Great post, Amanda, I love packing list stuff. I just picked up a couple pair of those underwear in a last minute decision before traveling for a month! I’m glad you recommend them! I haven’t actually tried them out yet other than testing that they really do dry over night! I’ve no idea how to pack for a month during which we’re moving a lot for the first couple weeks but quick dry seems like my best bet! Also, not only did I do packing cubes this time but I got pencil pouches with clear fronts to organize everything in my carry on back pack! I’m SO organized this trip! Hi Amanda, great post – my favourite piece of kit right now is my new camera – although I’m nowhere near taking as good a photo as your one at the top of this page! Awesome job. When it comes to photography, a lot of it is just practice, practice, practice! 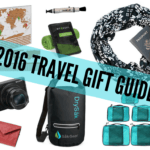 What a great list of travel gear you have here Amanda. I liked the hidden pocket scarf. I guess I have seen it somewhere before. I checked some of your photos on Instagram, and I can say you have excellent photography skills. Thanks, Karen! And yes, I love those hidden pocket scarves a lot and include them in a lot of my packing/gear lists! Great list Amanda! Thank you. Hi Amanda! my favorite piece of gear is a compact daypack (I like the Osprey daylite).. so practical! You can leave your big backpack in the hostel and go explore the city with a lightweight, small backpack. Always a good thing to have for sure! Nice list. 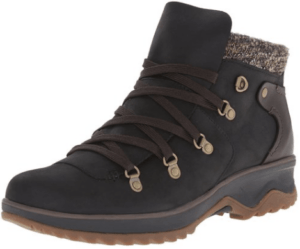 I need a new pair of hiking boots and Merrell are one of my favourite makes. I like your wee ‘trip to Scotland’ mention. I’m Scottish and love hiking. Great blog – keep up the good work! Great list! One question about the waterproof bag – I have the same camera set up as you I.e the Olympus omd em5 II with 12-40 lens – would you say that set up would fit well on a kayak? I’m planning on doing a kayaking tour on my next trip so it would be super useful to know if my setup will be ok. Thanks! ? Yes! I usually take a 5L dry bag with me when I do things like kayaking, and it’s perfect – it fits my Olympus camera and phone, but is small enough to wedge between your feet or anywhere else on a kayak. My favorite travel gear here “Pacsafe convertible bag” Really I love it. Thanks for the information! I’m currently traveling with that bag right now – love it!